In this tutorial I’ll show you how to use Adobe Photoshop to create a colorful, futuristic collage featuring a beautiful woman. I will also teach you how to retouch the artwork in Adobe Lightroom. First, we’ll isolate the model from the background. After that, we’ll add our background and create illustrations. Later, we will cut out the model’s eyes, create some faux sunglasses, and add in some stars to create that dreamy, futuristic mood. Then, we will add additional elements such as the crow, the UFO, the jewelry, and some tribal marks. Finally, we will adjust the contrast, vibration, and saturation using Adobe Lightroom. Let’s get started! Activate the Brush Tool (B) and select a blue color #0000ff to paint over the background. Press Control-Shift-N to make a new layer. Name the layer “S illustration”. Set this layer between the model’s one and the background. Activate the Pen Tool (P) and draw an S shape. Once we close the shape, we want to fill the shape with a different color. Click to bring up the option bar, and then select Fill Path. Choose color #fff21a and click OK. Once the path is filled, press Delete and use the Move Tool (V) to move the shape to the left. Now we want to duplicate the same path to bring more elements into the background. Press Control-J to duplicate the layer three times, and place the last copy layer of the third shape on top of the model’s image. Then we want to spread the illustrations around the background. Select each individual layer, select the Move Tool (V), and move each illustration around. 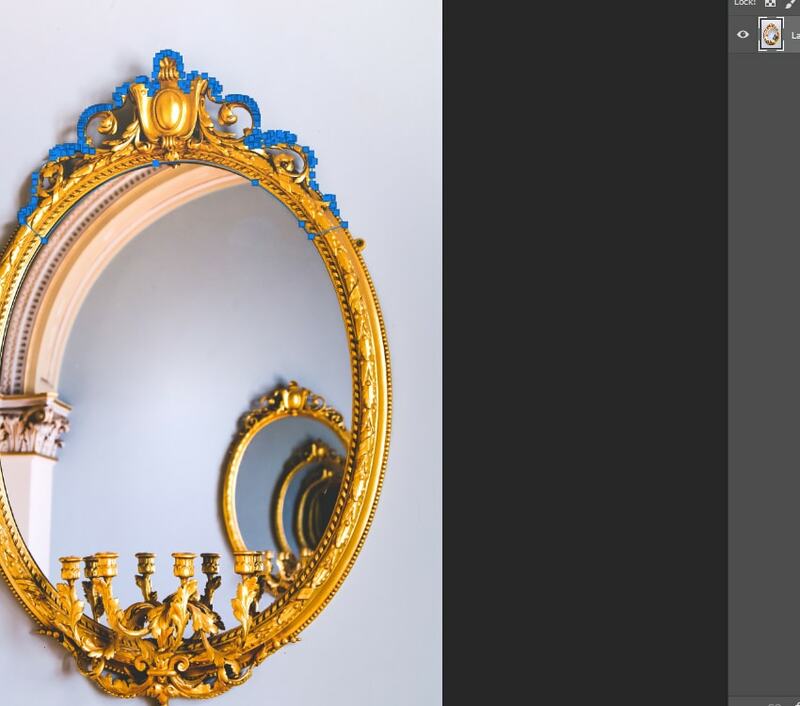 Open the mirror picture in Photoshop. 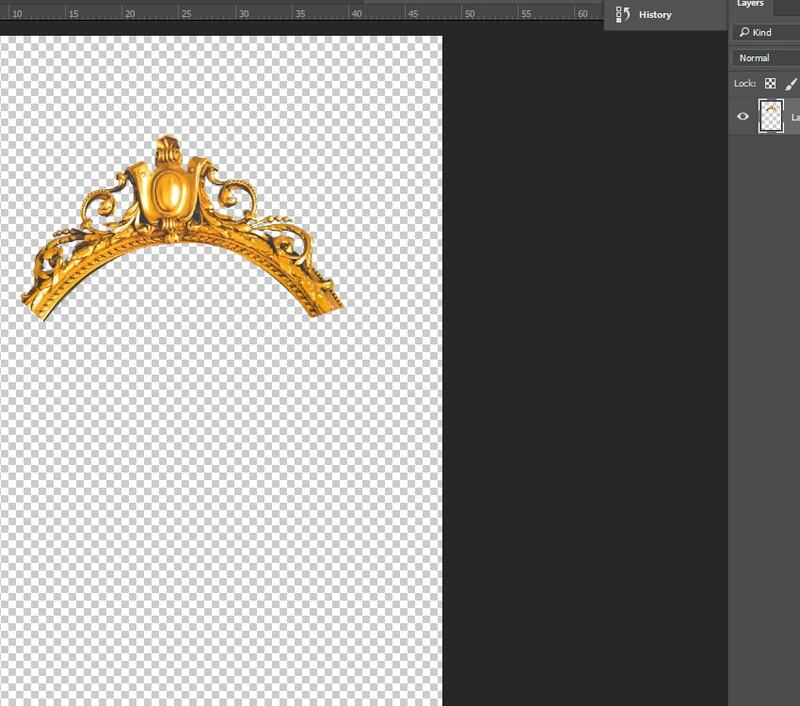 Use the Pen Tool (P) to cut the crown and remove the background. Drag the jewelry into the main file, on top of the model’s neck. Press Control-T, Right-click, and select Flip Horizontal to rotate the image. Then, press Control-T to resize the image, and hold Shift while resizing. Now we want to add some tribal marks. Use the Ellipse Tool (U), make sure the fill color is white, draw a small circle, and duplicate the layer seven times by pressing Control-J. Then use the Move Tool (V) and redistribute the circles on the cheeks, arms, and forehead. Now that we’ve added more elements, we want to create that futuristic/dreamy mood. Use the Pen Tool (P) and draw the outline of the sunglasses. Next, we want to remove the part we outlined and create our faux sunglasses with stars. Right-click and select Make Selection, and then hit Delete. Then bring the stars image into your main file. Place the stars layer under the model’s layer and lower the Opacity to 50%. Next, use the Pen Tool (P) to remove the extra part from the outline. We want to change the color of the illustrations. Double-click on the first illustration layer “illustration copy 1”. Choose Color Overlay, click on the color option, and change it by choosing color #27eef5. Do the same for “illustration copy 2”. Fill it with #e916bf and fill “illustration copy 3” with #27f5b9. Merge your UFO with the model. Select both layers, Right-click, and Merge Layers. Next, select the Model layer in the Layers panel and turn it into black and white. Click on Image > Adjustments > Black and white, and then click OK or Alt-Shift-Control-B. Now we want to split the bottom part of the model into slices to make it less solid. Select the model layer, and then select the Rectangle Marquee Tool (M). Next, click near the area of the arm and drag the marquee from one side to another. Then, Right-click, and select Layer via cut. Next, use the Move Tool (V) to move each slice to the bottom, leaving some space in between. Now we want to make the entire image pop out more. Export the photo as a JPEG from Photoshop. Import the picture in Lightroom. Then click develop. Boost the Contrast to +50, Highlights to +29, Clarity to +21, and Vibrance to +55. We want to play more with the hue. Go to the hue palette. Bring the Green hue to +100, the Aqua hue to -100, and the Magenta hue to +100. Then click on the Saturation panel. Bring the Red hue to +100, the Yellow hue to +29, the Aqua hue to +36, and the Magenta hue to +100. We want to darken the UFO and the model’s tank top. Click on a Brush Adjustment (K), and set the exposure to -3.04. Enable the Auto Mask option to paint inside the edges of the targeted area and paint over the clothes and the UFO. If you make a mistake, click on Erase. Reduce the size of the brush when needed. Next, we want to darken the necklace. Click on a Brush Adjustment (K), and set the Exposure to − 2.78. Enable the Auto Mask option to paint inside the edges of the targeted area and paint over the necklace. If you make a mistake, click on Erase. Reduce the size of the brush when needed.